It's the most wonderful time of the year! In the world of fine jewelry and haute horology as the thousands descend upon, Messe Basel, Switzerland. 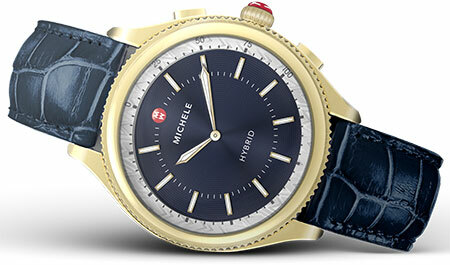 First out of the gate this year is a super special release from our partners at Michele Watch, as they get ready to unveil their new hybrid smart watch technology which beats within their upcoming Michele Connected Timepieces due to release this fall. Specifically designed for the woman who takes charge of their day, orchestrating it with the elegance of a master composer. A genuine alligator strap, backed with supple silicone adorns the wearer's wrist as the hybrid smartwatch system lays nestled beneath the decorated sunray dial. JRDunn is proud to introduce the Michele Connected Smartwatch. The perfect fit for an active lifestyle, the Michele Smartwatch takes beauty to another level. Featuring fitness tracking, haptic vibration for alerts, notification alerts, and a customization function button to control your music or even snap a photo! And we’re just scratching the surface, download the Michele app for even more additional features. Your life, connected.